First-place winners, the Illinois Tactical Officers Assoc. (L-R): Det. Sgt. Joe Holtz, Grayslake PD; Ret. Chief Jeff Chudwin, Olympia Fields PD; Deputy Kim Heath, Will County Sheriffs Office; Armor Express CEO Matt Davis; Sgt. Leo Kotor, Riverside PD; Commander Ed Mohn Winthrop, Harbor PD. Prizes included Laser Cut Plate Carriers with Level IV plates from Armor Express and V-PAM-certified Busch PROtective AMP-1 TP ballistic helmets. 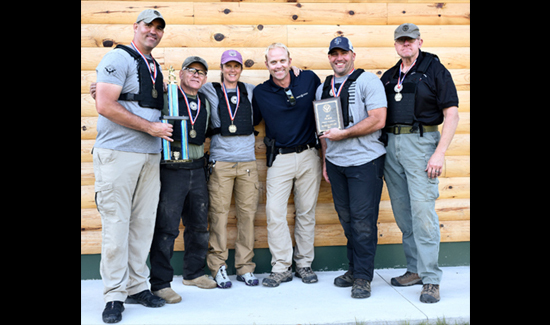 Scores of law enforcement officers and other first responders representing more than 25 agencies flocked to the first-ever Great Lakes Law Enforcement Challenge (GLLEC) held in September at the Shanty Creek Resort and Davis Shooting Range in northern Michigan. Participants immersed themselves in two days of educational workshops and exercises focused on strategic training and advancing modern-day skills. 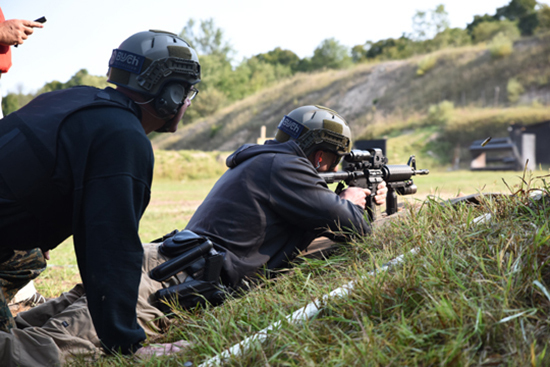 Among the featured activities were debriefs on major LE incidents presented by law enforcement leaders and certified trainers, live fire skills challenges, and an equipment showcase featuring the latest innovative tools and technologies for LE. GLLEC top sponsors included host Armor Express, Twaron, 3 Doors Down, Barrday, Busch PROtective, Dyneema, 556 Tactical, and Tru Armor. Keynote speakers included Officer Josh Comitale (City of Troy Police Dept. ), Sheriff Michael Kent Neal (Monroe County and former Corporal of the Arkansas Game and Fish Commission), retired Chief Jeff Chudwin (Village of Olympia Fields, IL); Commander Edward Mohn (NIPAS Emergency Services and ILEAS WMD-SRT); and Officer Dustin Mowery (Ohio State University Police). Classes focused on active shooter incidents, vehicle assaults/ambush, officer rescue, effective police response and tactics, and mission-critical equipment. The event was attended by several major tactical officer associations, including the Association of SWAT Personnel in Wisconsin, Illinois Tactical Officers Association, Indiana SWAT Officers Association, Michigan Tactical Officers Association, Northern Michigan Mutual Aid Task Force Emergency Response Team, Ohio Tactical Officers Association, and the Women’s Tactical Association. Shooters take aim down range during GLLEC 2017. At the center of GLLEC 2017 were the dynamic individual and team challenges. Ben Sonstrom of the Michigan State Police took 1st place in the individual challenge and the Illinois Tactical Officers Association captured the 1st spot for the team challenge. The 2nd, 3rd and 4th runners-up in the individual category were Mark Deleeuw (Holland Dept. of Public Safety), Jeff Klein (Holland Dept. of Public Safety) and Jeremy Rozycki (Detroit Police Dept. ), respectively. In the team category, 2nd, 3rd and 4th runners-up were the Northern Michigan Mutual Aid Task Force Emergency Response Team and Will County. See more about participants and winners HERE. More than 25 agencies participated including the Detroit Police Dept., Holland Dept. of Public Safety, Michigan State Police, and other agencies from Ann Arbor, Bellaire, Belleville, Coldwater, Freeport, Fruitport Township, Garden City, Grand Rapids, Houghton Lake, Joliet, Kalkaska, Livonia, Mt. Pleasant, New Haven, Oak Lawn, Riverside, Rochester, Saint Helen, St. Charles, Suttons Bay, Taylor, Traverse City, Westland, Will County, and the state of Wyoming. This year’s inaugural GLLEC was sponsored by a number of Armor Express industry partners, including 556 Tactical, BUSCH PROtective, ClearArmor, DSM Dyneema, Martintek USA, Ray O’Herron, Super Quick Clean Guns, and Teijin. Interested in attending next year’s Great Lakes Law Enforcement Challenge? Visit www.gllec.com and sign up for e-mail notifications about next year’s Challenge. We hope to see you there!